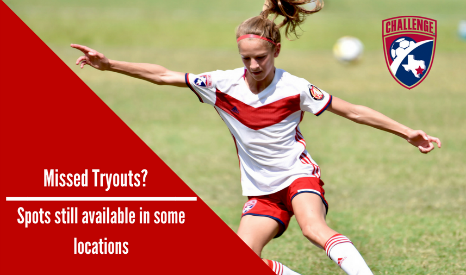 Tryouts for the U11-U13 age groups are over, but we still have spots open in a few locations. If you missed tryouts in these age groups please contact us for more information. Send an email to Ashley Fendley-Frazier at ashley.fendley@challengesoccer.com. Be sure to include your daughter's birth year and the location you're interested in in your email.